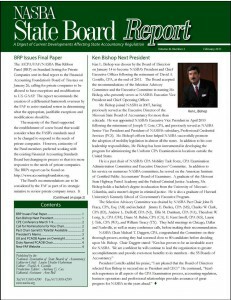 The inclusion of questions about International Financial Reporting Standards on the Uniform CPA Examination beginning in January 2011 continued to draw criticism at the July NASBA Board of Directors meeting, held July 23 in Grand Teton, WY. The New York Board is adamantly opposed to such test questions being on the exam at this time, NASBA Director at Large Richard Isserman, who chairs the NY Board, stated. Colorado sent a letter to the Board of Examiners several months ago protesting the questions launch in January and other similar critics were heard at NASBA’s June Regional meetings. President David Costello noted that at the Regional Meetings representatives of the Board of Examiners had explained that IFRS questions were called for by the practice analysis group, as companies are beginning to use IFRS and it is being taught in many colleges. However, President Costello pointed out that at the time of the practice analysis it was not known that the Securities and Exchange Commission would be contemplating possibly requiring IFRS no earlier than 2015. Mr. Costello told the Board he would bring their concerns to AICPA leadership. NASBA Treasurer Leonard Sanchez assured the Board that NASBA would end the year with a positive cash flow. Chief Financial Officer Michael Bryant noted there had been strong examination numbers during the last part of the year. NASBA’s income had grown primarily in the examination and compliance services areas and investment income is expected to show a 5 percent increase, he stated. Mr. Bryant assured the Board that funds for the Selection Advisory Committee’s activities had been included in the budget. The Board approved the FY 2010?2011 NASBA operating and capital budgets. Contract talks on the international administration of the Uniform CPA Examination are moving forward, Chief Operating Officer Ken Bishop reported. Two agreements are being worked on, one with NASBA and the AICPA to run through 2024, and the other abbreviated contract for the two?year pilot with NASBA, AICPA and Prometric. Mr. Bishop said the will cover the terms on which the NASBA Board had previously agreed. The restructuring of the CPA Examination Review Board was formally approved at the NASBA Board’s July meeting. As of August 1, 2010, the ERB will include five volunteers serving a minimum of two years plus three full?time staff: Wesley Johnson (MD) will serve on the Board for two years, Sandara Wilson (AK) for three years, Charles, Talbert,III, (SC) for two years, Nicholas Mastracchio, Jr., (NY) for three years, and David Vaudt (IA) of two years. Toerien DeWit will be Director of ERB Operations. Communications Committee Chair Sally Flowers (CA), encouraged NASBA to continue to use social media to reach out to students. Although some State Boards have started to use social media, more need to become involved with using what Ms. Flowers termed a “generational” media.